Low Carb Caramel Cheesecake Stuffed Apples have no added sugars, are gluten free, grain free and a perfect Autumn dessert! Check out my Review of Sukrin Gold Fiber Syrup as well! 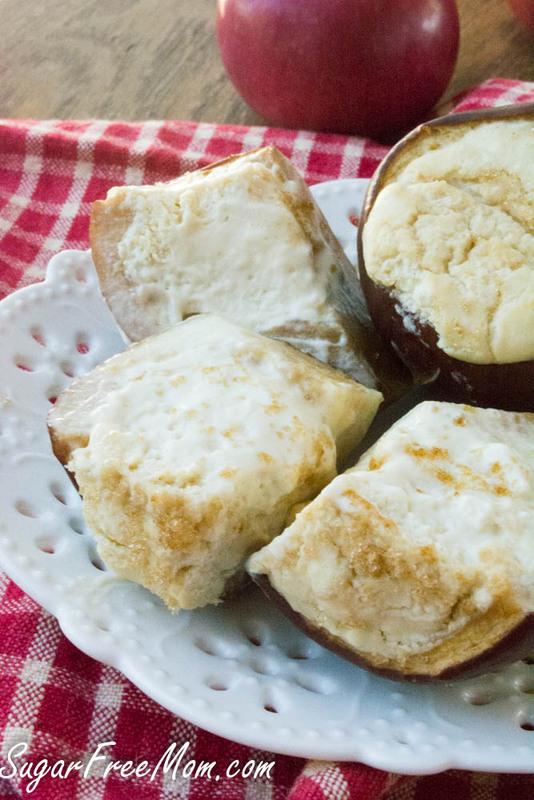 A ripe baked apple, especially in fall, makes for a tasty treat! But when you take that perfectly baked apple and use it as a shell for a caramel flavored cheesecake, well that my friends is the icing on the cake. It truly doesn’t get any better than a creamy cheesecake made without any added sugars and the natural sweetness from the apple all soaked into to it. 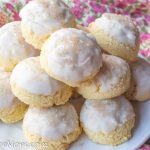 I’m drooling just thinking about a bite of these! Recently I was provided some samples to review of Sukrin USA, Non GMO sugar free products. My first experience was using their brown sugar substitute called Sukrin Gold. 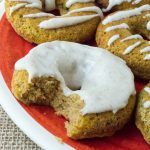 I made some incredible tasty PUMPKIN DONUTS that were a big hit with my family! Today I’m sharing about my experience using the Sukrin Gold Fiber Syrup that is just pure delicious sugar free syrup that reminds me of maple syrup only better! Better because it doesn’t spike my blood sugar causing me to crave and crash from a sugar coma! 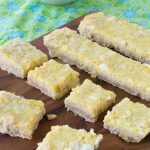 The best part about this recipe is that once you do the hard work of scooping out the insides of the apples, the rest is super easy. Your mixer will do the work and you will fill, bake, chill and enjoy hearing the oohs and aaahs from your family! This Sukrin Gold Fiber Syrup is perfect on anything where you would typically add some maple syrup, like here in my Grain Free Pumpkin Pancakes! But on top if these apples, oh my, it’s magical! 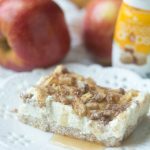 This recipe almost reminds me of a caramel apple on a stick, but my difference is the apple has been hollowed out and filled with luscious cheesecake! My kids and friends who came over ate these up with their fingers! No fork needed and they ate all of the apple as well! 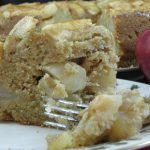 The first time I made this recipe I used Macintosh apples. The kids liked the soft exterior but I found them to be a bit mushy. The second time I made this I tried Red Delicious apples and the firmer apple appealed more to me then the kids. Any apple that you personally enjoy will work here. If you don’t have cinnamon steiva, add a 1/2 tsp of ground cinnamon. If you don’t have the Surkin Gold Fiber Syrup which provides the caramel flavor you might want to add another teaspoon of the maple extract I used below to add that flavor or use 1 tbsp of molasses or maple syrup, but that would cause the sugars and carbs to increase in this recipe. To get the Net Carbs, I substract the fiber from the total carbs and here it is 8.9 grams. 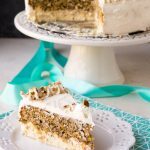 While this recipe is not sugar free, it is free of added sugar and the sugars you see are natural from the apples. Check Out all the wonderful products Sukrin makes! Disclaimer: This recipe and all it’s content has been sponsored by SukrinUSA.com. As always, all opinions are 100% my own. Thank you for supporting the brands I enjoy working with. Chop off the tops of the apples, scoop out center to 1/4 inch from edges and discard. Place them in a baking dish. In a stand mixer add the cream cheese and mix until smooth. 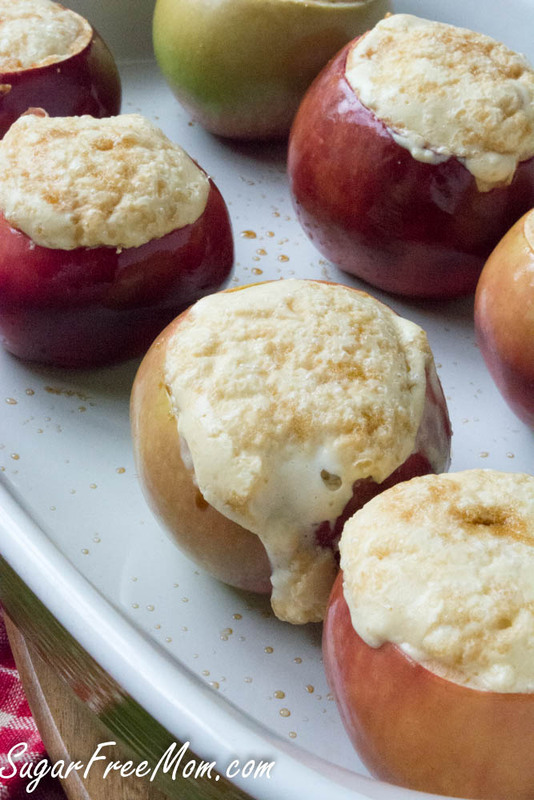 Pour batter into each apple, sprinkle Surkin Brown Sugar sub if using and bake 30 minutes. Cool then refrigerate for at least 3 hours or overnight. Enjoy with a drizzle of Surkin Gold Fiber Syrup. Holy cow! 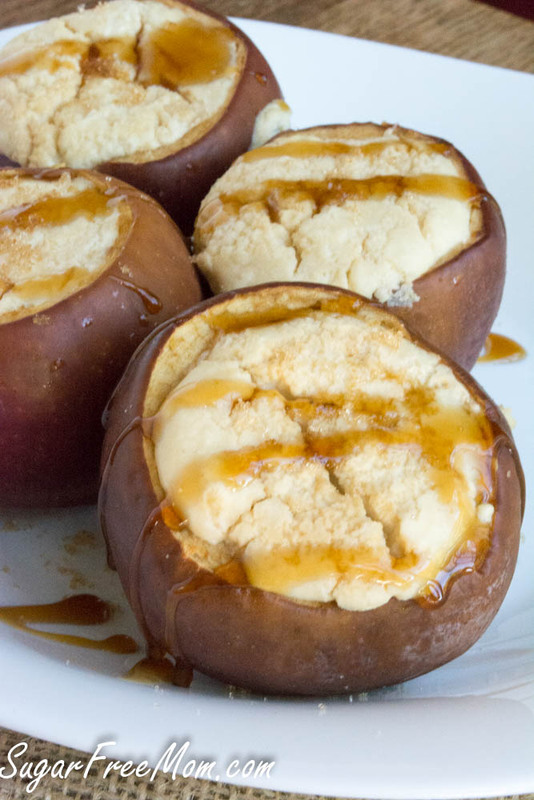 These inside out carmel cheesecake stuffed apples are genius! 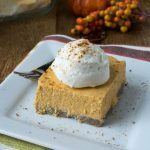 Such a perfect healthy fall dessert that everyone will love! 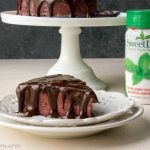 I love these sugar free recipes, but I cannot find many of the ingredients at my local stores. I was happy to find Vanilla Stevia finally in Target, but cannot find other flavors. Can anyone use the discount code you put out on line? I want to try these but I’m cconfused. 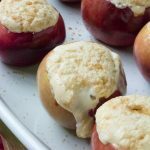 You cut off tops of apples then do you scrap inside of apple out to add cream cheese filling or just add on top of apples before cooking them? Scoop all inside out of apple, I scraped till about 1/4 inch away from the edges. 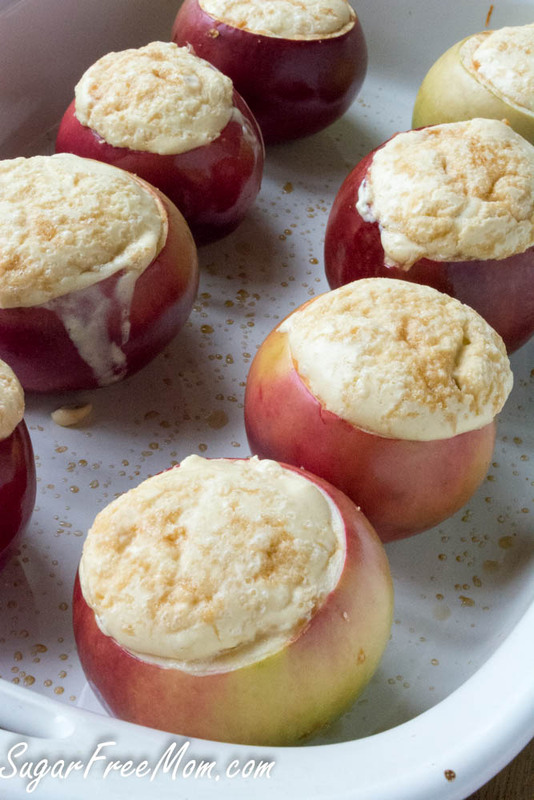 Don’t scrape through the bottom of the apple, it needs to be like a bowl to hold the filling when baking. this recipe is genius, brenda. 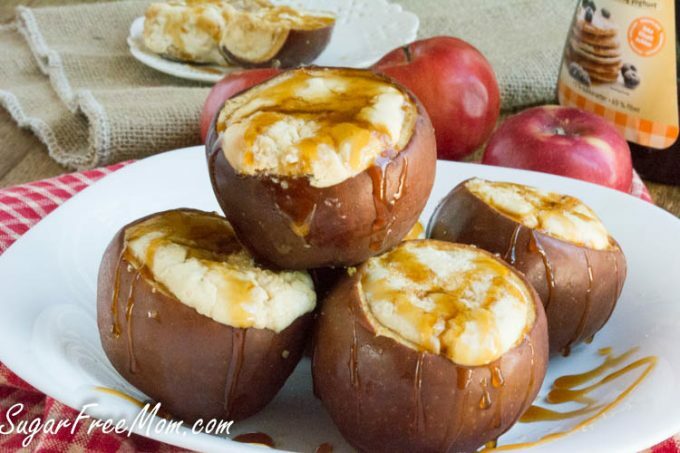 i’ve made a lot of nut butter and cinnamon filled baked apples but never would’ve thought of cheesecake in an apple!! i cannot wait to try this. i have swerve granulated sweetener but haven’t ever seen sukrin before. do you know if it is in stores yet? I think it’s only online, haven’t seen it in store but is it so worth it! I’m loving it so far! And thank you! Wow these look incredible! 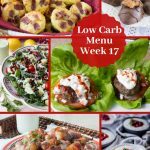 I am always looking for delicious sugar free dessert ideas! We will definitely be trying these this weekend. 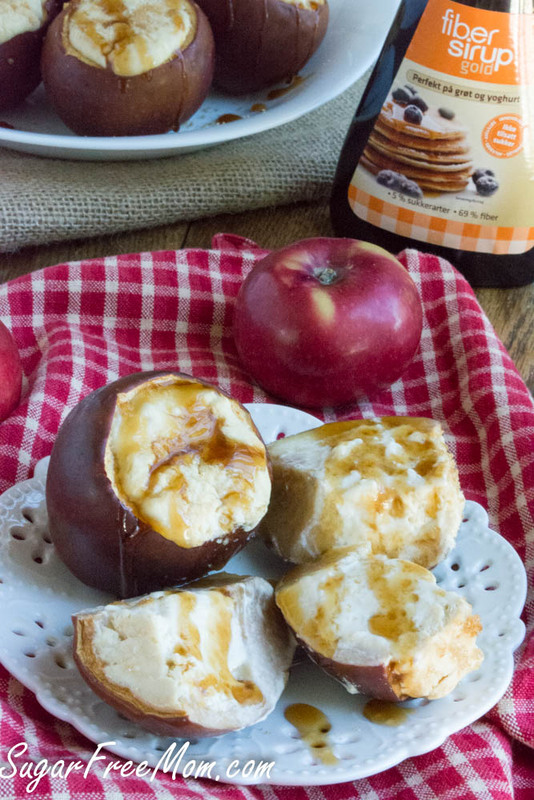 Our favorite apples are honey crisp. 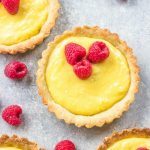 Do you think they would be too sweet for this recipe? These look delicious! Can you serve them warm?